As part of our continued efforts to improve usability, changes to the Client Overview have been included in this release, including a redesigned side navigation panel. Involvement History now has its own section, designed to allow for easier access to important data. The Client Photo has also been redesigned for ease of use. The Edit button has been removed and users now access the Edit Photo dialog by clicking on the photo. The Specialty Court Overview has been redesigned to make information more accessible. This will affect the overview of Specialty Court involvements only. The Involvement information card has been replaced with an information heading section at the top of the overview. 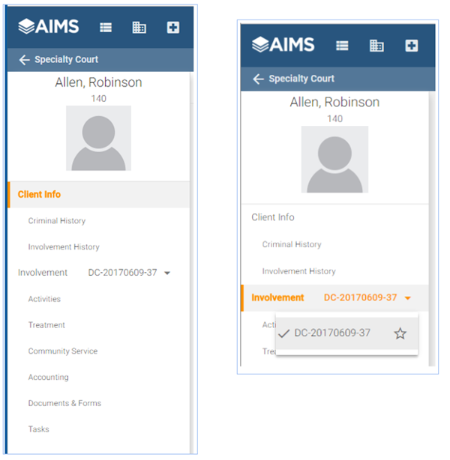 In this section, users will see important details regarding the Specialty Court involvement, including the addition of Sobriety Date. Users can also change the admission date and add/edit a Warning from this section. Additionally, there is now a DUI information card that will display on on DUI Court involvements. This card displays important data regarding the DUI involvement, including the location of the incident, details of the administered BAC test, any drugs detected, if an accident occurred and if the incident resulted in injury or property damage. Promote, Demote, Suspend, Reinstate, Graduate, and Terminate a Specialty Court involvement by clicking the drop down on the Change Phase Status prompt. The drop down list will only display if the client has an active involvement. The drop down will only present logical options for selection (i.e., promotions will only be available when the client is not on the last phase of the track, demotions will only be available when the client is not on the first phase of the track or Reinstate will only appear if the Participant had previously been Suspended). AIMS now supports a location-based security model. This type of security model allows an agency to fine-tune the granularity of permissions based on their organizational structure. Agencies can use these capabilities to establish security policies. Steps for how to setup can be found here. The Microsoft Word data template creation now has a “Associate” Word data tag option. 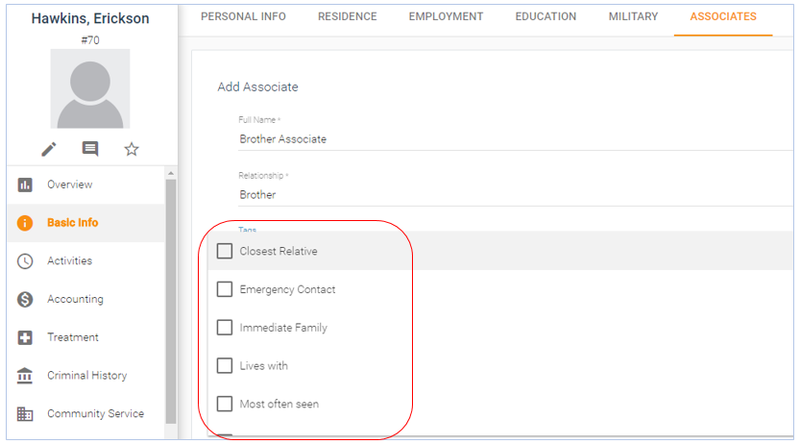 This provides access to the (user selected) Associate data with the following available data tag options: Name, Relationship, Address, and Phone Number. The Microsoft Word data template creation now has a “Criminal Case” Word data tag option. This provides access to a Client’s Criminal Case data with the following available data tag options: File Date, Case Number, Court Name, Judge Name, Room, Most Serious Offense and Charges. When adding or updating an Associate record, there is a new drop down field labeled “Tags”. This will allow entry of additional data that provides a deeper look into the association of the Client and their respective Associates. The current available tags are: Closest Relative, Emergency Contact, Immediate Family, Lives With, Most often Seen, Reference, and Victim. Associate Tags are look-up values and can be modified or expanded by a System Administrator. The “Tag” data will be displayed on the “Associates” Basic Info screen header of the Associates data grid.